Alexa, owned by Amazon, aims to transform raw data into insightful information that will help users optimize their site’s performance. Alexa collects internet users’ traffic data via the Alexa toolbar, which is the earliest web-tool of its kind. Having been adopted relatively ubiquitously within the US, Alexa is still, despite other rising stars, the most commonly used tool by online media buyers and marketers to evaluate 3rd party websites for advertising purposes. 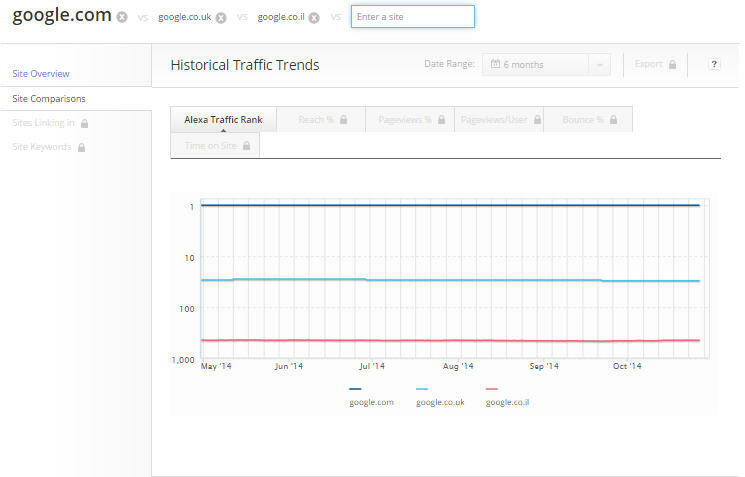 Alexa traffic rank: global/local. This rank is updated daily, and is a combined rank of the site’s average daily visitors and pageviews over the past 3 months. The $9.99 a month “Basic Package” includes a limited set of the site overview metrics presented earlier; it doesn’t include the search queries used, traffic sources or downstream sites and contains only a sample of the site’s backlinks and demographics data. 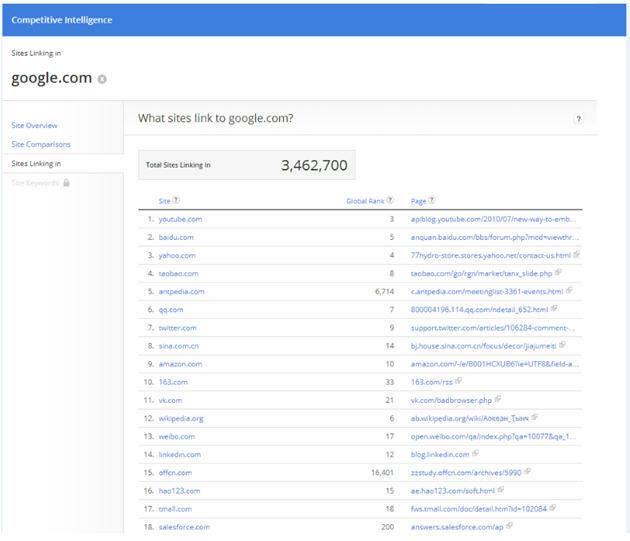 The $49 a month “Insight Package” includes a detailed version of the metrics presented in the basic package, as well as a full backlinks analysis, traffic sources and downstream sites, but only a sample of the search query data. The $149 a month “Advanced Package” includes a full backlinks and keywords analysis for sites with up to 200 million page views a month, in addition to the detailed metrics presented in the Basic and Insight packages. The $799 a month “Advanced High Traffic Package” includes the same features as the Advanced Package for site with up to 1 billion page views per month. Alexa is currently offering a one week free trial for the Basic, Insights and Advanced packages. The free version (which still requires registration), offers a site comparison tool, in addition to the site’s overview metrics. It enables comparison between the Alexa traffic ranks of up to 10 sites. All of the paid versions enable a comparison between the following metrics of up to 10 sites: Alexa traffic rank, Reach%, pageviews%, pageviews/user, Bounce%, time on site, reputation metrics, traffic sources and demographics. 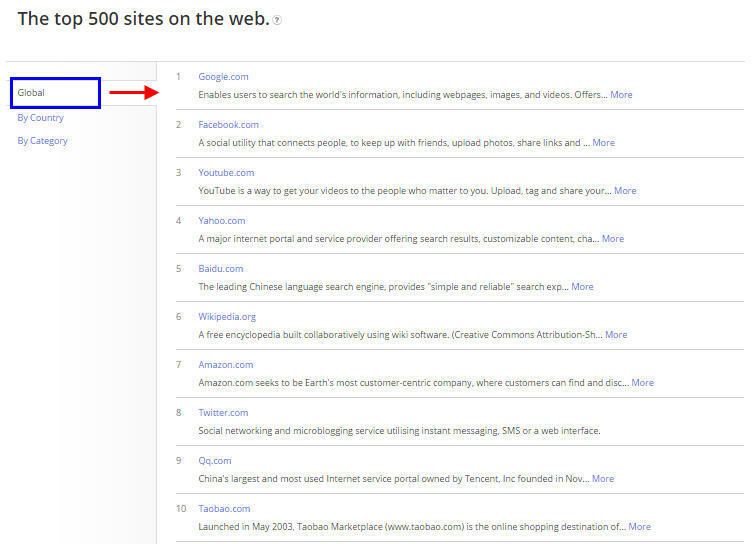 The tool also allows browsing through sites with a high Alexa traffic rank. The global view presents the top 500 sites in the list, while you can also look for the top Alexa ranked sites by country and by category: education, finance, etc. The site offers to download the Alexa toolbar which includes the Alexa traffic rank, related links, Wayback option and search analytics. Every user who installs the toolbar is transmitting data back to the Alexa servers and is thus included in the Alexa poll. According to Alexa, it samples data out of the millions of Internet users who are using one of its “thousands” of browser extensions, one of which being the Alexa traffic rank toolbar. Other than the Alexa toolbar, the site doesn’t specify which additional extensions it uses in order to track internet users’ activity, but we may speculate that some browser extensions within the larger Amazon group do participate in the data sampling. From the user perspective, the toolbar/extension provides an immediate traffic rank for each site visited, and from Alexa’s perspective each such user contributes its own browsing data to the poll. Some of the data is collected directly through sites that have chosen to install the Alexa script on their site – Alexa offers to get your site’s metrics “certified” which means that the site owner can install an Alexa certify code on its website and it will measure the website’s traffic directly. Most of the certified sites are from the US and among them are websites like: Dmv.org.com, Payoneer.com, ero-advertising.com and etc. Surprisingly, Amazon.com, which owns Alexa, did not implement the Alexa certified code on its site. 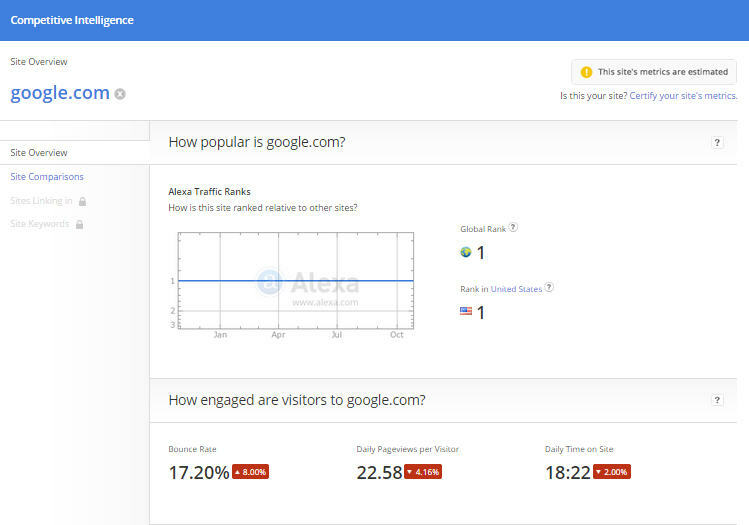 Significant metrics like the number of daily ‘unique visitors’ are only available for sites that have implemented the Alexa certified code. From the publisher perspective, having the certificate is a seal for the authenticity of the traffic they report to their advertisers, or potential advertisers. Some important distinctions: Alexa is presumably presenting a global view of internet users while in fact most of the certified sites are within US, and the Alexa toolbar itself is only available in an English version, which limits its exposure and reach to non-English speaking internet populations. Alexa has a relatively high reach within US internet audience; the site is backed up by Amazon’s distribution power. It is a widely used tool by online media buyers and marketers who evaluate 3rd party websites for advertising purposes. 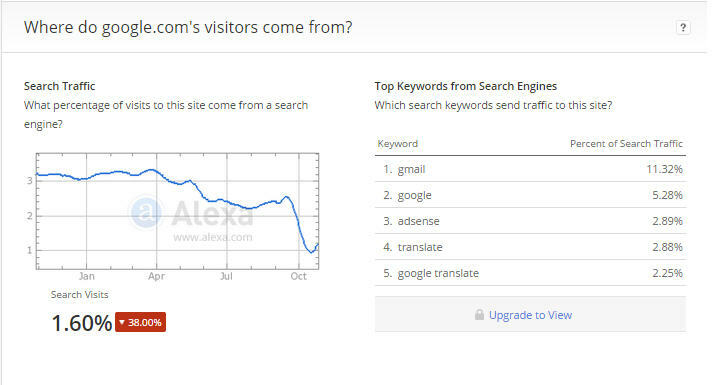 The Alexa traffic rank is a unique indicator that updates daily and is a combined rank of the site’s average daily visitors and pageviews over the past 3 months. The tool is relatively simple and easy to use; it includes a limited number of factors which in our experience creates less clutter in comparison to competitors’ tools. Most of the metrics represent an average of the last 3 months which is not obvious at a quick glance, yet the site does include a “further information” button in the form of a question mark next to each factor which clarifies what it relates to. There are several graphs which add a visual aspect to the data, but the graphs’ actual data seems very hard to decipher and is presented backwards, which is both confusing and misleading. It could have been helpful to have an option to enlarge the graphs and present them in a larger and more detailed scale. Overall, in comparison to other similar tools Alexa’s design seems a bit outdated, yet it remains clear and intuitive. As Alexa’s About Page proudly announces, they prefer substance to style. Accordingly, their site is relatively clean with no visual distractions to ensure the actual data gets the respect it deserves. Alexa offers an easy to use, quick and general overview of your site. The free version offers two options; the basic one doesn’t require creating an account while the broader version requires a quick user name and password registration. The site focuses on substance as opposed to style so it is very convenient to get the information you are looking for without any distractions. The Alexa rank is a unique feature that serves as a traffic indicator for many investors and site owners and it is part of what differentiates Alexa from other similar sites. One of the interesting factors the site offers is a list of ’Upstream sites’ which present sites that clients visit prior to the site in question (as opposed to referring sites). The paid version also allows comparing between various parameters of up to 10 sites which can provide helpful information regarding competitors. The ’My Dashboard’ section allows you to manage your data and save your site comparisons for future reference, get an SEO audit of your site, and create your very own toolbar. The free version is quite limited and presents only a sample of the data. The Alexa rank of sites with relatively low traffic will not be measured accurately due to sample size and centralized audience. The audience demographic may often present information with what Alexa refers to as “low confidence level” and it doesn’t provide any numerical score, but only difficult to decipher blue colored boxes. 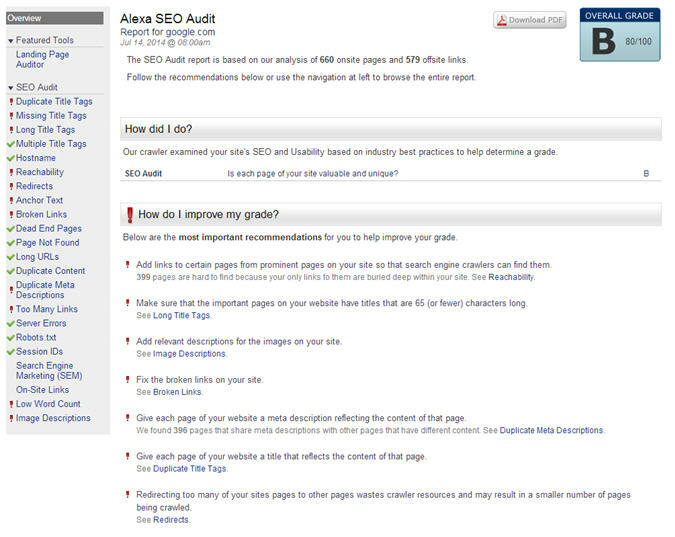 Significant Metrics like ‘unique visitors’ are only available for sites which have implemented the Alexa certified code. 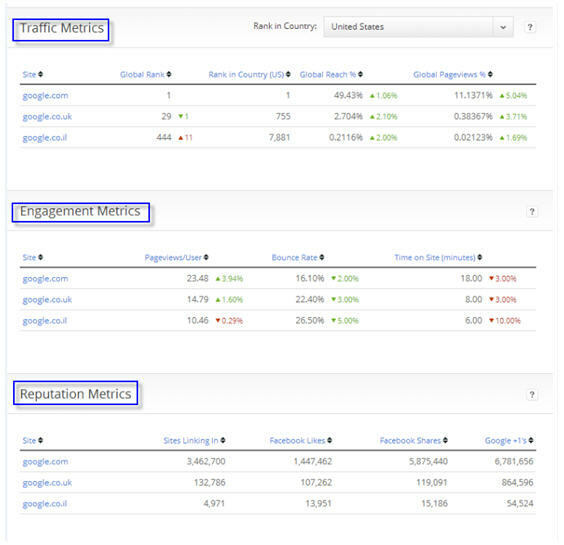 Other than the Alexa rank, a detailed version of the metrics presented can be easily found in many other similar sites. A savvy user won’t be able to find enough value in the free version of the site while other free versions provide insightful data for marketing professionals (for instance the free versions of sites like Similar Web and SEMrush). Alexa presumably presents a global perspective of internet users’ traffic, while its certified sites are mostly from the US and the Alexa toolbar itself only has an English version. There may not be enough data from a particular country, because there are not enough toolbar users who visit the site, hence some of the data presented is questionable. Since the Alexa rank is determined by users who downloaded the Alexa toolbar, the data is susceptible to manipulation, especially when trying to analyze a category or a niche that may not have a large audience participating. Alexa’s current marketing power stems from the strength advertisers ascribe to it, which is based on historical positioning and reputation. The main drawback is that users who download the Alexa toolbar are probably not a neutral objective group that represents the global internet population, but essentially compiled out of many interested parties such as marketers, website owners etc. As the internet evolves, other data collection methods may outperform and chip into Alexa’s market share. Alexa has a rich history of providing analytical insights to benchmark, compare and optimize businesses on the web. Alexa’s tools are designed to serve digital marketers and site owners as well as publishers and investors. The metrics presented by Alexa may not be enough to satisfy the data needs of savvy marketing professionals. However, for marketing professionals interested in a quick site overview or publishers scouting for their next online advertising space, the Alexa Rank is still a great indicator of a site’s popularity and therefore can assist with competitive analyses and certain business decisions. One of the biggest drawbacks of Alexa’s data panel has been that until recently, its “global data” was sourced mainly from sites in the US. However, in early October 2014, Alexa announced the inclusion of new data points which will significantly increase its global traffic panel. Whilst it is still too early to tell, it will be interesting to see the impact these new sources will have on the accuracy of their metrics. 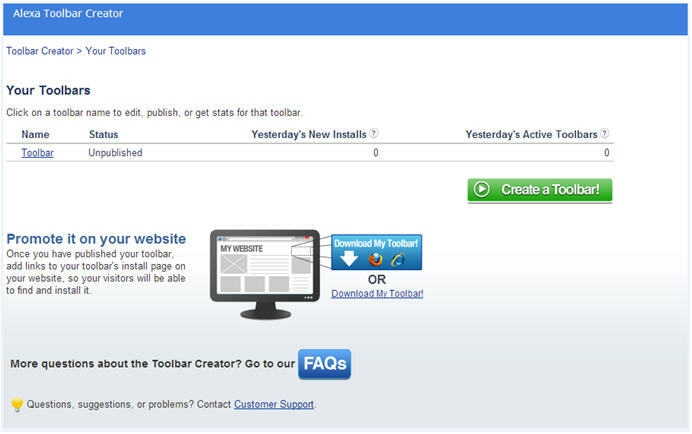 *Alexa has kindly informed us that the toolbar creator was recently retired, however the browser extension is still available. Do you use Alexa? 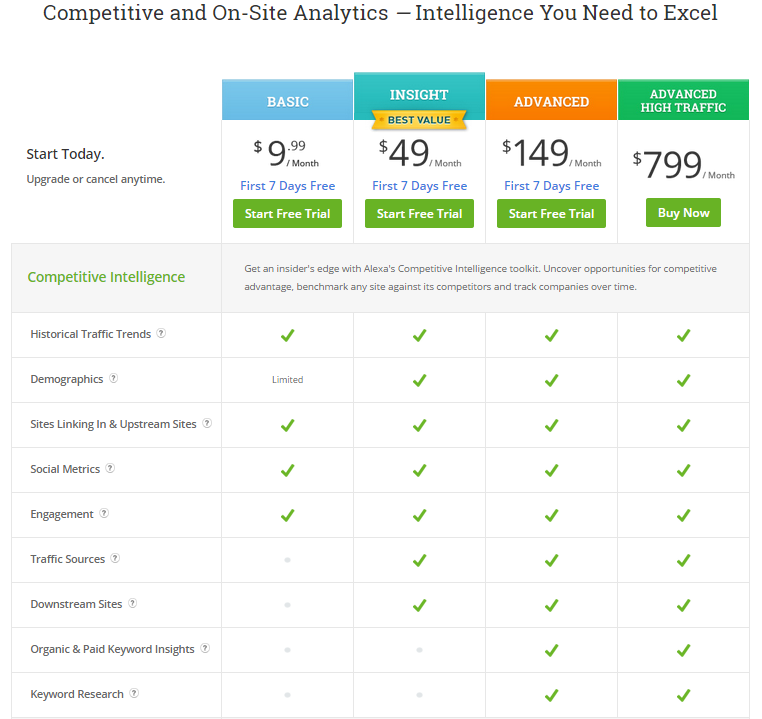 Tell us about your experiences with this competitive intelligence tool.